These bulbs are small generally used for lighting in small applications and kitchen appliances such as in microwaves, cooker hoods, ovens and fridges or freezers. These bulbs are also use for decorative purposes for hotels, restaurants and displays. 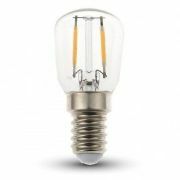 Due to their small size these bulbs are very versitle and can provide lighting in small areas and small spaces where other bulbs are simply too large.